At first glance, the physical appearance of the South Dakota State University campus is different than when I arrived as an undergraduate student in 1971. But the university’s mission as an 1862 land-grant institution remains the same – to be a beacon of opportunity by providing access to higher education, championing the creation of knowledge and understanding, and continuously expanding the reach of the university across South Dakota and beyond. At SDSU we challenge our students, faculty and staff to imagine. Imagination is the most powerful tool we have to achieve our personal dreams. It is also a powerful tool as we seek to fulfill the collective responsibility we have to one another. Standing on our historic land-grant mission, imagination is the catalyst that has helped our students and faculty have a positive impact on helping change the world. SDSU students are provided with the education and opportunity to become the next generation of CEOs, architects, public officials, musicians, engineers, artists, scientists, health-care providers, farmers and ranchers, inventors, graphic designers and more. Our faculty continue to stretch the boundaries of knowledge, making discoveries through research and scholarly work that will drive tomorrow’s technology and foster global awareness. Today, the classrooms at SDSU do not look like the classrooms of yesterday. While technology continues to change in order to enhance learning, the students and faculty themselves are different. They come from nearly every state in our nation and over 90 countries. They come from different backgrounds and are more racially, ethnically and culturally diverse. This diversity enriches our campus community and helps prepare all students to live in a dynamic and exciting world. 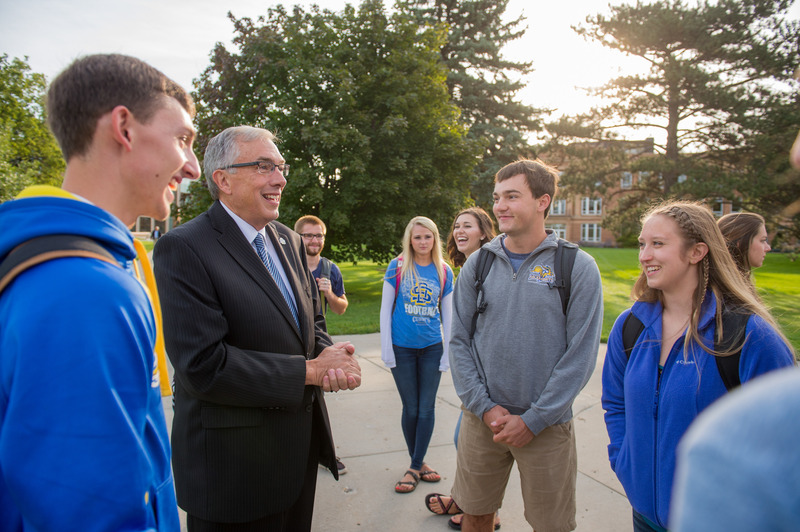 South Dakota State University remains a strong and healthy institution of higher education. Our imaginations can guide us into the future as we continually seek to fulfill our land-grant mission of providing the benefits of higher education to all through education, research and outreach. The university generates nearly a billion dollars in economic impact throughout South Dakota from a state investment of just over $64 million. That’s clear proof our high-performing faculty and staff, with strong academic programs, effectively and efficiently educate and train our highly motivated students. It’s a responsibility we take seriously, one that guides our university every day. We are excited about the future and the role SDSU will have in shaping the dynamic landscape of our state and region. Jim Ducker has been hired as an internal auditor at South Dakota State University.